Tata hit kid to death at 32 No. Under Ranipul JS Sikkim around 1.30pm today afternoon. Near Kabrasthan. Police approaching now..
32 No Truck accident, Claims One : Dead Body of kid aged 12 years taken out from the gorge. The truck rammed and sweeped kid sitring near maize market roadside parapet into gorge inside river, truck also fell into river. Still unsure how many was there in truck that's hardly visible in river. 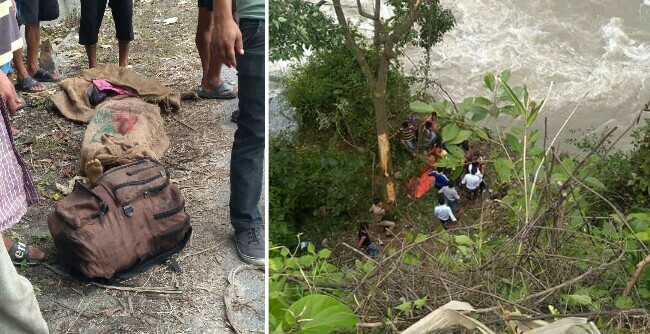 32 No accident : Deadbody of kid brought up from gorge, but how many people were there in Tata that's submerged in river is unfound still. Driver of truck who sustained head cut injuries was taken to Gangtok. Tuck hit two other vehicles before it sweeped kid sitting on road side into gorge , inside river. Rescue Team has reached the river with equipments to rescue in case anyone is trapped inside Tata that plunged down ramming a kid to death today.